Nice shot, I love the beach. Great capture! Are those rain/storm clouds? Happy WW! Beautiful scene. I really like the muted tones. Very dramatic, I almost feel claustrophobic. It looks like a storm's brewing! Did you get caught in it? see! NJ is a beautiful place! Looks a bit chilly! Run for cover, I think it's going to rain! If you'd like to take a look at mine - check this post - out! Where in Jersey is this? I love the shore! That is a lovely picture. Love the beach view! What a gorgeous wide beach. Makes me wish I was there, walking, enjoying the sunrise. Lovely! Those clouds coupled with that little strip of pink make for a fabulous skyline. 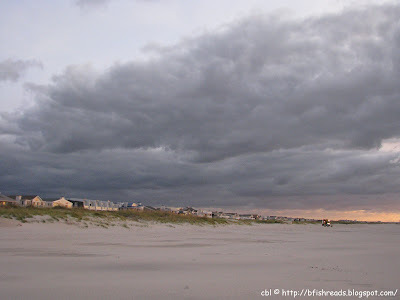 what a powerful shot of the elements, the clouds are dark and oppressive, and the sand is the same gray color. I love how the sunrise gives a glimmer of hope between the two grays, I especially like how the light is cast on the houses. thanks for stopping by today, and thanks for sharing this shot. My favorite of the day. One of my favorite things in life (besides books) is watching a storm come in. Not that I really would want to be on a beach when that happened, but still! This is a beautiful picture! Storm clouds are breath-taking, amazing and a vivid examply of nature's power. When I see clouds like this I think of the watercolor painting class I took years ago and all of the different colors combined to create clouds like these, purples, grays, blues, yellos & greens, a little brown. It helped me to really see the clouds. Storms make great cloud pictures. Looks like winter is moving in just like it is here. We've already got some snow in the mountains. Now see, I think your shot is stunning too! I love the beach in cloudy weather. Oh, this is just so beautiful and dramatic! I want to be there, inside that photo. Love it. Have a thing with dramatic sea-scenery. Great shot! Wow, look at those clouds! Wow! Looks like it's cooking up a storm! Beautiful picture!!! I think I was in Ocean City back in 1997... my very first trip to North America. It would be great to be on the beach when it is raining.. wow! This reminds me of my whole collection of cloud pictures. I should dig them out and post them sometime.